Proper dress shows an appreciation for that tradition that has led most of us to take up this sport. 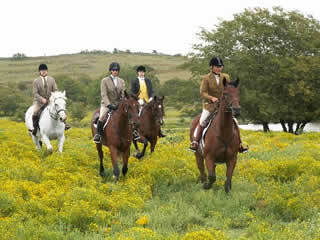 The preservation of the centuries-old foxhunting spirit depends, more than anything else, on the continued observance of the rules of etiquette that distinguish this activity from simply riding casually around and through beautiful properties. HFH depends on landowners, masters and huntsman for the enjoyment derived from years of work and seasons of hunting. The leaders of the hunt work hard year round to provide members the opportunities to follow hounds and nothing shows appreciation to the landowner, huntsman or master more than to see a well turned-out field of riders who conduct themselves properly. This demonstrates the members’ recognition of the efforts made on behalf of the field. Having said this, Harvard Fox Hounds recognizes that individuals who are new to the sport may require time to assemble the proper attire and complete wardrobe for the sport. During cub hunting season there is no distinction in attire between members who have been awarded colors and those who have not. Tweed jacket; canary or tattersall vest optional Tan, beige or brick (rust) breeches; black or brown field boots or black dress boots Turtleneck shirt, button down shirt with tie, or ratcatcher shirt with stock tie; string gloves. Colors should be subdued and primarily earth tone. Black or brown protective hunt cap with chin strap required. Once the official hunt season begins, more distinctions apply based on the member’s gender and whether or not he or she has been awarded colors. There are, however, four elements of proper turnout — headwear, neckwear, gloves, and vests. 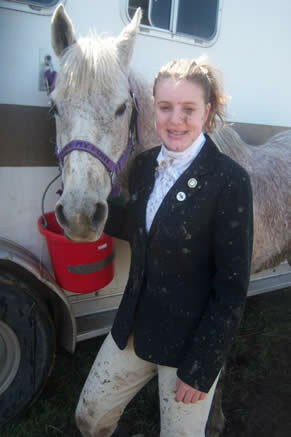 • Headwear: All members of the field are required to wear a hunt-style helmet or approved for equestrian riding helmet. Safety harnesses are recommended and, if the helmet is so equipped, the harness should be kept latched at all times during the hunt. Ribbons at the back of the helmet should point up. (Masters and professional staff signify their positions by turning the ribbons to point down. • Neckwear: The appropriate neckwear during formal season is a white or cream stock tie, properly tied and secured with a gold pin. The pin should be placed horizontally. A full length, four fold stock is preferable both for the sake of appearance and, more significantly, in the event it is needed as a bandage or sling. It is also recommended that the ends of the stock tie be secured to the shirt or blouse with safety pins to assure the ends of the tie do not work out from beneath the coat and flap loosely in the wind. Embellished stock pins are sometimes seen. Men may wear a formal long necktie with a collared shirt. • Gloves: Gloves worn during formal season may be black, brown, either dark or lighter shades such as tan or buff, full leather. White or buff string gloves or chamois gloves are suitable for rainy conditions. • Vests: Appropriate vests are canary or tattersall. A vest made from material matching the hunt’s official color is also acceptable in that hunt field only. Canary is the most formal color. Coat: Plain black, oxford, or dark navy hunting jacket with a single vent or frock coat, with plain black buttons or club buttons if awarded by the Masters. Coat: Black, oxford or dark navy hunting jacket or frock coat with buttons displaying the hunt’s emblem. A gentleman with his colors is entitled (although not required) to wear a scarlet coat with the hunt’s color on the collar and with gold buttons embossed with the hunt’s emblem. A gentlemen member of the field should wear a single vented jacket with three buttons. Masters signify their position by wearing four buttons and a huntsman, or a master who also hunts hounds, wears five buttons. Scarlet is appropriate for special days such as Opening Meet, Blessing of the Hounds, and New Years Day. 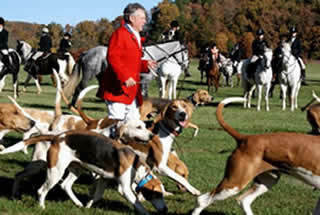 It is also proper to wear scarlet for a joint meet where one’s hunt is the host hunt. However, scarlet should not be worn to a joint meet where you are the guest of another hunt unless the host hunt has extended the invitation for guests to wear their colors. Boots: Black dress boots with brown leather tops are correct with both black and scarlet coats. Plain black dress boots are also acceptable with black jackets but not with scarlet or frock coats. Black garters are worn when wearing a black jacket. White garters are worn when wearing white breeches. 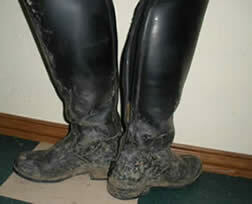 Rubber boots, as described above, are acceptable on inclement days. Headwear: A standard hunt-style or approved equestrian helmet is proper with any attire. Coat: Plain black, oxford, or dark navy blue jacket with plain black buttons or club buttons if awarded by the masters. A lady without her colors may also wear a black shadbelly. Ladies may wear a frock style coat. Boots: Plain black dress boots (i.e, without black patent leather tops). Rubber boots, as described above, may be worn. Headwear: Standard hunt-style or other safety approved equestrian helmet. Coat: Black, oxford, or dark navy blue jacket or frock coat with black buttons imprinted with the hunt’s emblem in white and with the hunt’s color on the collar. A black, oxford, or dark navy blue shadbelly may also be worn, with the hunt’s color on the collar and black buttons with the hunt’s emblem, and is particularly suitable for formal days such as Opening Meet and Blessing of the Hounds. Boots: Black dress boots with black patent leather tops and black patent garters. Ladies with their colors may wear plain black dress boots. Rubber boots, as described above, may also be worn. Headwear: Standard hunt-style or safety approved equestrian helmet.